The Blog Formerly Known As The Blue Cottage: Hostess Gift For The Holidays! Hostess Gift For The Holidays! Jolene, I have my tiles! They are absolutely gorgeous! They look even better in person. Very rustic, very classy. This was exactly the look I was trying to go for. I appreciate your time and attention to this project. I think your style is great. Thank you so much! I like working with natural stone tile. I like the way it gives a rustic 'time-worn' look to the things I create...those who know me know that I love to create things that appear to have a 'history' - as if it has just been re-discovered in your grandparents basement - or found on the dusty shelf of a roadside thrift shop. Let's talk! Send me an email or leave me a comment and I will contact you! Those coasters are to splendiferous for words. Is there no end to your talents? 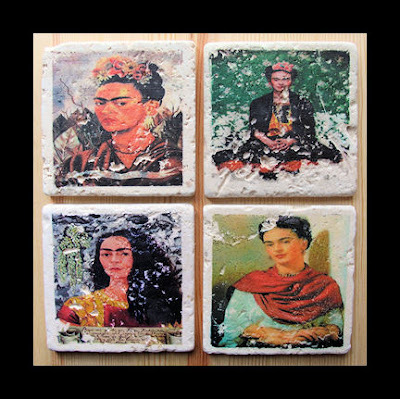 i don't know frida but i'm sure no matter the images your coasters are just to die for...unique items to decorate a styling dinner or to give away as a personal gift to a friend or an lovely present to a host as well a splendid idea to someone special for xmas!! Very beautiful tiles...very cool ! Muy bonita! I'll bet she'll love them!! Britt-Arnhild, Cat, Ellen - your comments make me SMILE :-) Thank you! Melanie & She Who Flies....so nice to meet both of you!!! And thank you so much for leaving your comments...it means so much to me! Makin' Art - Not War !